Blizzard has dropped a brand new Overwatch animated short - Shooting Star - this time focusing on pro gamer, and star of the MEKA squad, D.Va (aka Hana Song). In the video, we see D.Va behind closed doors and away from the spotlight working tirelessly to prepare for the next Omnic attack. Despite the rest of the MEKA squad doubting D.Va's concerns, it seems she was right to be worried. The Omnic attack happens much sooner than anticipated, leaving D.Va to deal with it alone. In addition to this insight into D.Va's exhausting work ethic, Blizzard announced a brand new control map - Busan. 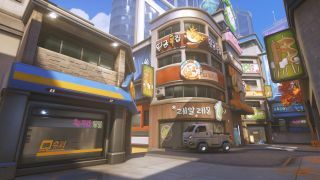 Busan is broken up into three prominent locations within one map: Sanctuary, Downtown, and MEKA Base. While the Sanctuary captures the ancient beauty of South Korea, Downtown encompasses the modern hustle and bustle and MEKA Base (the home of the Mobile Exo-force of the Korean Army) gives an insight into how D.Va is when relaxing at home. Each location serves as a control point or your team to capture or defend. The Busan map is now available on the PTR, meaning it should make its way onto the normal live servers in a few weeks.